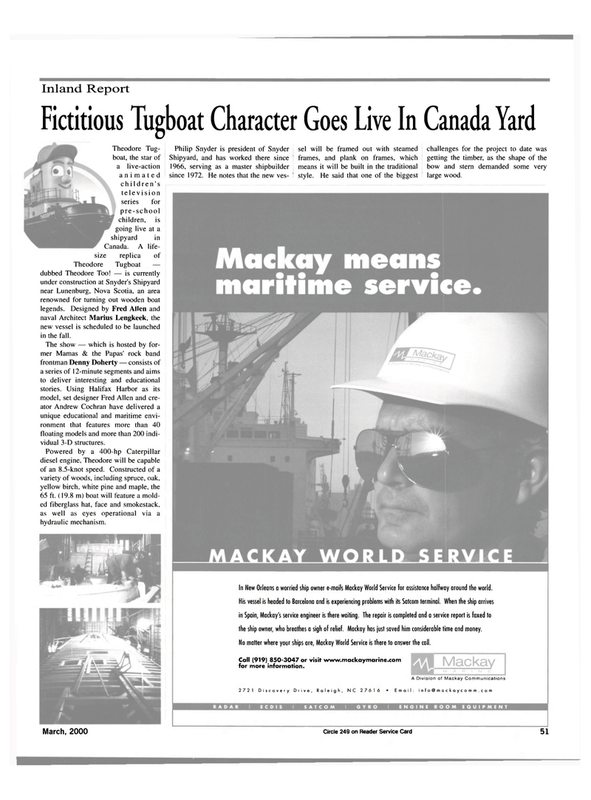 In New Orleans a worried ship owner e-mails Mackay World Service for assistance halfway around the world. His vessel is headed to Barcelona and is experiencing problems with its Satcom terminal. When the ship arrives in Spain, Mackay's service engineer is there waiting. The repair is completed and a service report is faxed to the ship owner, who breathes a sigh of relief. Mackay has just saved him considerable time and money. No matter where your ships are, Mackay World Service is there to answer the call. Call (919) 850-3047 or visit www.mackaymarine.com for more information. Shipyard, and has worked there since frames, and plank on frames, which getting the timber, as the shape of the 1966, serving as a master shipbuilder means it will be built in the traditional bow and stern demanded some very since 1972. He notes that the new ves- 1 style. He said that one of the biggest large wood. Theodore Tugboat — dubbed Theodore Too! — is currently under construction at Snyder's Shipyard near Lunenburg, Nova Scotia, an area renowned for turning out wooden boat legends. Designed by Fred Allen and naval Architect Marius Lengkeek, the new vessel is scheduled to be launched in the fall. The show — which is hosted by for- mer Mamas & the Papas' rock band frontman Denny Doherty — consists of a series of 12-minute segments and aims to deliver interesting and educational stories. Using Halifax Harbor as its model, set designer Fred Allen and cre- ator Andrew Cochran have delivered a unique educational and maritime envi- ronment that features more than 40 floating models and more than 200 indi- vidual 3-D structures. Powered by a 400-hp Caterpillar diesel engine, Theodore will be capable of an 8.5-knot speed. Constructed of a variety of woods, including spruce, oak, yellow birch, white pine and maple, the 65 ft. (19.8 m) boat will feature a mold- ed fiberglass hat, face and smokestack, as well as eyes operational via a hydraulic mechanism.